March | 2013 | Thoughts from the Shteiblech. Keeping the Lithuanian Vision Alive: Rabbi Berel Wein and Chief Rabbi Warren Goldstein. This past Tuesday evening Gila Fine was in conversation with Rabbi Berel Wein and Rabbi Warren Goldstein, the Chief Rabbi of South Africa. The evening marked the publication of their book ‘Legacy’, written on the history of Lithuanian Jewry. No, not the same atmosphere and experience as when Gila was talking with Chief Rabbi Sacks last month. Nevertheless, it was an enjoyable evening and we certainly went away enriched, with food for thought. We heard from Gila, the story of Rabbi Yisrael Salant, who limited his Shabbat and Yom Tov meals to two hours to make sure the kitchen staff was not overworked. This showed the supreme importance of sensitivity and ‘Kavod La’briyot’-respect for human beings, above any other Jewish belief. This story reflects the ideals underpinning Lithuanian Judaism. As I, myself, have Yekkish roots, the values and ideas that were described, by both Rabbi Wein and Rabbi Goldstein as characterizing Lithuanian Jewry: Derech Eretz, ‘Ehrlichkeit’, middot tovot, integrity, kindness, thoughtfulness, decency, high moral and ethical behavior etc. were not new to me and it was reassuring to hear that they were still valued. In fact, at times when I was listening to Rabbi Goldstein reminded me of how I felt when I was listening to my Rabbanim back in Hasmonean or in Shul in London. It was nice to hear this type of ‘Heimish’ and simple, straightforward ‘Frumkeit’ spoken about in Israel, too. It made a nice change from the politics and more aggressive and extreme type of Judaism we see in Israeli society. I would like to suggest two other differences between the Lithuanian and German, ‘Torah Im Derech ‘model. Firstly,in Lithuania, a greater emphasis was placed on the learning of Torah and less on the importance of secular studies and knowledge. Let us not forget the Yeshivot (Volozhin, Mir, Slobodka etc.) they produced. 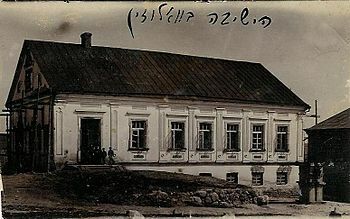 In the Yeshiva of Volozhin, for instance, R’Chaim made sure there was a twenty four hour clock rotation, to make sure Torah was always being learned. Secondly, the Lithuanian system seemed to put more emphasis on introspection, depth and the inner spiritual world. The German, Hirschian school did not. However, both the Lithuanian and Germanic approach placed greater emphasis on a restrained and modest type of ‘Frumkeit’. Unlike nowadays, especially in Israel, where spirituality seems so free and external, neither the Lithuanian nor the Germanic schools of thought emphasize external forms of piety, such as wearing Tzizit outside. Firstly, over 98% of Lithuanian Jewry was wiped out in the Shoah. I did not realize the numbers were so high-so very tragic. Secondly, in response to a question at the end, he commented that the Jewish People after the Shoah are living in a ‘hospital’- we have been eternally traumatized. As a result, some of the aspects and characteristics that the Lithuanian education system focused on, such as the refinement and exemplary middot, which Rabbi Goldstein kept on referring to, are not always overtly seen. The Shoah has changed us as a People and we have been damaged. I would like to add to what Rabbi Wein was referring to. In Israel, Israelis do not always have the patience and state of mind to be as pleasant and ‘Ehrlich’ as the Lithuanian system may demand. However, life here is different. What we may at times lack in refinement and manners, we make up by our warmth, ‘mesirut nefesh’ – self-sacrifice, and the fact we are living in our Homeland despite all the challenges. The effect of the Shoah on Lithuanian Torah and the communities that were destroyed is absolutely devastating and horrific. However, by living up to the high morals and ethics, the ‘Ehrlichkeit’ and value system that Lithuanian Jewry stood for, we can at least keep that sacred legacy alive. Even in Israel, where life is more stressful and pressured than other parts of the world, we should try to impart the Lithuanian principles described in ‘Legacy’. If we do, then life here will be more pleasant and easy and the society would be more Jewish.